We’re so excited to celebrate this much-anticipated release with you by giving away some awesome prizes! 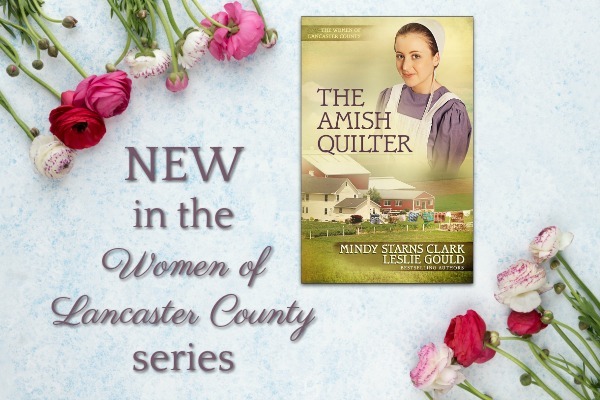 Grand prize: The grand-prize winner will receive a handmade quilt from Lancaster County and the Women of Lancaster County series (5 paperback books)! Runner-up prizes: Three other winners will each receive a paperback copy of The Amish Quilter, a mug, and a kit for making their own mug mats! How to enter: In order to make sure your name is entered in the drawing, you’ll need to use the Rafflecopter form below. Log in with your email address or Facebook account, then complete one or more of the tasks to submit entries! Can I submit more than one entry? Yes! You’ll need to subscribe to Leslie’s or Mindy’s e-newsletters (or already be a subscriber) to get your first 3 entries. If you subscribe to both, you’ll see on the form that this will unlock additional ways to enter the drawing. The more tasks you complete, the more entries you’ll have in the giveaway. Terms and disclaimer: Four winners (one grand-prize winner and three runner-ups) will be randomly chosen and announced on June 1, 2018. We apologize, but due to varying international giveaway regulations and shipping restrictions, this giveaway is open to US residents (age 18 or older) only. Void where prohibited. This promotion is in no way sponsored, endorsed, administered by, or associated with Rafflecopter or Facebook. Can’t wait to read this latest book! So glad you’re excited, Cathy! Beading and gardening are two crafts I enjoy the most. Plus Reading..Also Playing Bingo & doing Word Search. I love to read. I have at least 5 totes of all Amish books that I have read at least half of them. My husband said I can start my own library. I love reading Amish books and learn from them. I love to read Amish books. I Love to read and Write ! Love the Amish culture and heritage..
would love to win this love reading about The Amish Thank you for the chance! I love to read and work with glass creating jewelry. Have always been interested in the Amish since I was a little girl. Little did I know my former husband is of Amish/Mennonite ancestry. I like to paint ,read and crochet.. I feel my special talents are gardening, food services caring for my grandson, and helping others. I love reading Amish books and can’t wait to get my hands on latest books.I love to sew and really enjoy all the quilting books. I crochet everyday, or if not I love to embroidery. That’s wonderful, Donna! I love that you do it every day. I am a gardener! Love to have my hands in the dirt! You must love this time of year! What a great pastime! Happy Release Day My favorite hobby is reading. I love quilts but, I am not talented enough to make one. Reading is so much fun! And you’re definitely among friends here. I do some counted cross stitch. Can’t wait to get email that I have won!!! Can’t wait to read the books. I can’t wait to read the new book! Reading and scrapbooking are my favorite hobbies! I love reading and trying new recipes! I would love to read this book …Thank You for the chance to win all the prizes…. You’re welcome, Judy! Good luck! Reading is my favorite hobby. I have a book in my hand whenever possible. I love the combo of these two authors! I think I have most of the books but both. Not a very talented person, but I do enjoy quiet walks in the country, bowling, and teaching my young teen Sunday school class. Being an avid reader, I spend more of my spare time doing this than anything. Love all things Amish. I’m looking forward to this new series. I love to cook and do crafting, don’t know if I am good enough to be considered talented but I sure enjoy both! Love the combo of these two authors. I’m an avid reader, and spend most of my spare time relaxing with a book. Not very talented except for maybe getting together with friends from church and doing decorations for VBS. I don’t know if I have a special talent but I like to do things for others without them knowing. Love it! Good for you. Thankyou for the chance to win,love Amish books,i have visited Lancaster three times.Love all the quilt shops.I have not got a quilt but i do have a quilted table cover which i have received many compliments. I love your books! Happy Release Day! Lovely giveaway! I love all of the Amish books and would love to read “The Amish Quilter”. Thanks for the opportunity to win prizes. Would love to read the book and have a chance at winning the beautiful quilt. I enjoy reading, knitting, cross stitching and making baskets. Love to sew & read! I’ve been reading other books in this series and really enjoying them. I like to do crafts and sing. This is such a sweet giveaway. Love both of these authors. I love to read,this would be a good book of yours to read that you for a chance to win. What a joy this giveaway is. My absolute favorite hobby is reading Amish books. Beverly Lewis’ book The Covenant had me hooked. I crochet and recently started quilting. I am not great at sewing but have actually found an Amish woman willing to help me. She actually offered to sit down with me and show me how to alter one of her dresses and give it to me. She is truly a sweetheart abd blessing to me. Congratulations to the two of you. Thanks for letting me try to win these wonderful prizes. Love these two authors. Cannot wait to read their newest books! Please enter me in this great giveaway. I crochet. I didn’t start until I was in my 40’s. I have made many afghans, baby afghans and prayer shawls. I make prayer shawls for my church’s Prayer Shawl Ministry and just this week started making baby afghans for the hospital where I volunteer (rocking babies). That is so wonderful, Joan! I love that you learned a new skill and now use it to bless others. I am a paper crafter. I enjoy making banners, cards, and scrapbooks, but my true love is reading! I’m on my third Amish novel this week! My favorite hobby is flower gardening, I love watching things grow and bloom. I love photography and doing various other art forms. On really nice days I love to drive around Amish country looking at their beautiful horses and shopping for spices and bedding plants in their local shops. One of my favorite ways to spend a day. My favorite hobby is reading. Thank you for the opportunity to win.Have a wonderful week. I mostly did crochet and counted cross-stitch. I have made a couple o quilts and done embroidery too but could never get the ‘hang’ of knitting lol. Sounds like you’ve made lots of beautiful things! Yes I have, both for family and friends and sold a lot too, back in the day, lol. I do some flower gardening. We also do a lot of camping in our motorhome. Read a lot. Thanks for the chance to win. Yay! Happy to hear that, Joyce. My special talent is reading for hours! I don’t really have any talents but I love to read and do reviews. Doing reviews is absolutely a talent–one that we authors truly appreciate. I enjoy sewing and making quilts with my daughter. And I do have a talent for reading and can’t wait to read this new one by Leslie and Mindy. Thank you for the lovely giveaway. Aw, we love that you have a hobby you can enjoy with your daughter. That’s wonderful! And yay for the reading talent! I love to bake and cook. I’m blessed with a husband that does too. Nothing makes me happier than the two of us (now that he’s retired) in the kitchen making something to share hoping to put a smile on soneone’s face and contentment in the belly. As I’m getting older, it takes me longer to get it done but the work shared by two sets of hands gets done in time for it to go on the table. That is so sweet, Kay! That’s the best, when you can share the work and make special memories. And such a great way to bless others too! I can’t wait to read these what a great giveaway! I’m enjoying the story. It’s neat you’ve continued the series. Will there be more? This is the final one in the series. I love to read, go fishing, and go bowling. I love to scrapbook! Thanks for the giveaway! I love to crochet,quilt,read and I’m a cake decorator. I love to read , travel , cook , music , quilting and trying to learn embroidery. Thank you for allowing me to enter your beautiful give away . I bake, cook, and grow a garden. I love sewing and reading Amish books. Thank you for the give away. I collect quilts and would love to learn how to make them. I am a super good cook & baker & my hobby is gardening. I’ve been told I have a green thumb. Can’t wait to read this book would love to win! Thank you! What a beautiful Amish quilt! I would just love to win this fabulous prize and read your newest book. Amish handmade quilts are the best! I love to read and love to bake and cook also I love to fish! I love to make handmade candles and do applique on wool samplers. I have always wanted to learn to quilt! My hobby is reading and making pies! I guess pmaking pies would be my talent too! Eating pie is my favorite! My husband and I like to make pies too–and I blog about them now and then, for example here: http://mindystarnsclark.blogspot.com/2018/01/more-fun-with-pie.html. I always do a “Our Year in Pie” post every January, with a photo of one pie per month from the previous year. Good luck in the giveaway, Debi! I enjoy crocheting! Love making things for my family and friends. What a gift! Your family and friends are blessed. Puzzles can be so much fun and a great challenge! I love to quilt, read and garden. All such great things to do! I love to read and do puzzles. I’m a teacher who would love to read the books over summer vacation…after sleeping in. Sounds lovely, you’ve earned it! Handiwork that I do most of is mending. I have an old quilt that I keep mending the seams. I have two started projects of latch hook and embroidery that I rarely work on. I have some knitted strips that I hope to make into a blanket some day. I am more drawn to reading than the handiwork. Hope I win. Really like Amish genre books, especially ones with a mystery. Lots to enjoy now…and then later, when everything’s grown! Hope you’ve been able to spend some time gardening this spring. I would love to win this contest! Leslie Gould has been my favorite author for years! I like to knit and crochet. I also enjoying reading. I love to read. I used to do a lot of crafting like crochet, needlepoint, and cross stitch, but with my arthritis I can’t do much of that anymore. And I’m really into anime and manga. Reading and crochet are my two favorite things to do. I wish I could quilt. I’ve already read this book! Loved it, couldn’t hardly get anything done. I couldn’t put it down. Great read ! ! That’s great, Mickey. So glad you enjoyed it! I enjoy gardening, watching birds and reading. Also I love to plan special things for our grandchildren when we host Cousins Camp in the summer for a week (three busy girls). I can’t get enough of the good clean Amish books. Thank you for the chance to win an authentic Amish Quilt! My talent is reading. I dabble in crochet. I collect books on quilting and made some basic quilt told but haven’t quilted them yet. right now my favorite is Scrapbooking but I have made a blue jean quilt before. I enjoy reading and sewing….at the moment Amish fiction and historical fiction are my favorites. Thanks for the opportunity to win. Love these books. I enjoy needle point I also love reading Amish books. I have visited Lancaster, PA numerous times and love it each time I go there I make sure to go to the Farmers Market and also Kitchen Kettle. Fun! Did you know you can rent hotel rooms at Kitchen Kettle? They’re upstairs, above the shops. I’ve been going there for years and never knew until somebody pointed it out to me. My favorite hobby is reading. However, cooking and traveling are also high on the list. We deal a lot with genealogy in this series, so you’d probably like it. :). In my house, my hubby is the one with genealogy for a hobby. He can spend hours on ancestry.com. Don’t really have any hobbies, but love to read & do word puzzles. Love your books! I try to crochet every day and when I finally get unpacked and find my cords to my sewing machine, I can start quilting again and making aprons for children. Thanks for a chance to win . Love watching the birds. I’m a new crocheter & I enjoy it very much. Thank you for the opportunity to win one of Mindy Starnes & Leslie Gould’s books! I love to read. Do stamped cross stitch and would love to try the new jewelry art. I’ve enjoyed reading your books and look forward to this one. book. Books and reading are definitely one of my hobbies, I wanted to get back into cross stitch and ceramics, but instead I have the wondeful job of caring for my first grandchild. I also will be taking care of my husband, as he will be having open heart surgery. He has a mystery mass floating in his heart! Thank God he had an EKG that found it. Wow, I hope all goes well. Blessings to you both. I make award winning jam and until last summer, sold it at farmers markets. I have done some quilting but not as good as what the Amish .My favorite hobbies are cross stitch and crocheting. Thank you for this chance to get a book. I have enjoyed their books. I enjoy baking and am pretty good at it. Now if you could just remove the calories. The quilt is gorgeous! I love to read and do reviews and I enjoy cross stitch. I love reading: the Bible, nonfiction and fiction books, cookbooks, children’s books, and more. Plus I currently get three newspaper subscriptions. With real paper I can hold in my hands. I love both Leslie and Mindy’s books, separately and together. My favorite things to do are reading and quilting (hand paper piecing at the moment). My favorite activity is stamp collecting. Love both of your books! Would love to win. My hobby is collecting Precious Moments figurines. I love reading and used to cross stitch before my carpal tunnel surgery. This is an amazing giveaway! I love just about any type of craft. My two favorites are quilting and crocheting. I am currently working on a quilt where I will add a few crocheted embellishments. It’s one way to be able to do both things I love! I love to read, cross stitch, garden, and enjoy puzzles and board/card games. Thanks for the giveaway opportunity! Besides reading, I sew and bake. I love reading & working in the garden, Thanks for the chance at this amazing giveaway. I’m trying to learn crochet! I love gardening and working in my yard! Thanks for the opportunity to win! Hook rugs i hate spell check on tablets. Soap making is my hobby. I enjoy Amish books. I enjoy reading, crochet and cross-stitch. and blog about the books that I read. I crochet and my twin sister quilts. This is a very special giveaway. Thanks for the opportunity to enter! I sew and make gifts for people that are special to me. I would be great to win. My favorite hobby is READING! As for special talents, I love to sing, and I am a pretty fair piano player. I also enjoy writing – not books, though. Mindy Starns Clark has been a favorite author of mine for quite some time. Leslie, since reading the Cousins of the Dove series, which incidentally, she wrote with Mindy. Awesome series! I love Amish books, too, so would love to win these! I love to read, garden and try new recipes. Thanks for your giveaway! I do the card ministry for shut ins and sick at our church and I enjoy reading. I am not very talented. I love these books and can’t wait to read book 5! I enjoy knitting and crochet and making vinyl crafts with my Cricut. I also like to color and enjoy Bible journaling. Thank you for the wonderful giveaway opportunity! I love to bake and share special treats with my family and friends! Oh, I love this series! I love to scrapbook, read, make my own greeting cards, cross-stitch, read, do puzzles and did I mention reading? I love baking, sewing, and reading! My ultimate dream in life! Books and a quilt! I’ve loved Amish for 50 years so please pick me! I am looking forward to reading this book. This is a great giveaway. My hobbies are reading,crocheting, organizing, baking and etc. My special talent would probably be a good listener. I love to quilt. My husband made a special sewing room for me and I quilt all the time. Such a fun hobby! Thanks for the chance at this very special giveaway!! We were just in Lancaster County last month! Love it there! Even took a wagon ride. My favorite hobby (aside from reading) is gardening! I’m loving watching my garden come to life. Thank you for the opportunity to win! I enjoy reading and listening to Christian music in my free time. Sewing and quilting is not my gift. I do love quilts. My husband’s grandmother made him a quilt as a child. After we were married she gave us several quilts. She also made each of our children a quilt. There is one I absolutely love that I use to cover up when I watch TV. It is falling apart after 30 years of use and much love. I would love to win! Thank you for the chance. Good luck to all! I would love to win this! Thank you for the opportunity! Good luck to all! My hobby, besides reading and blogging, is photography. Would love to read these books. Love Amish books. I’m a super mom and love to read oh and try new food! Other then that I’m trying to learn water color and embroidery. I love to do crafts and read! Thanks for the chance to win all these books…they sound wonderful! I enjoy container gardening and I love to read. I love reading about the Aumish in novels, really hope I win. Thanks for doing this giveaway even if I don’t win!! I love Amish books and quilts. My grandmother made beautiful quilts. Thank you for a chance to win a copy of Leslie Gould and Mindy Starns Clark’s book. My mother would love it too! I like to sew when I have the energy for it. Years ago I did a little quilting. I do sew small projects, some are quilted, for gifts. Now, I mostly make cards and send them to family and friends. I also crochet some too. Sounds like a perfect gift for Mother’s Day. Would love to win this series of books! My favorite hobby is hot air ballooning. Yikes! I’m too scared of heights, but I’m sure it’s lovely. Good for you! After a 3 year hiatus, I have recently begun cross stitching again! There are so many beautiful patterns out there now, I think I’m in trouble. I cannot possibly stitch fast enough to keep up with all the patterns I would like to buy! My Mother n law made quilts. I loved watching her. She tried to teach me but I couldn’t get the hang of it. I love reading and spending time with my 5 grandchildren. I’m not very creative thus I don’t have any hobbies but I do read. A lot! I have read books by both authors. I’ve read several Guidepost series that both authors have written books for. I’m crossing my fingers that I win. I love to read and also knit. Nothing fancy but it’s a relaxing thing to do. I’d love to read this series and will happily leave reviews. Yay! We love reviewers and really appreciate the effort. I enjoy counted cross stitch and embroidery but my favorite hobby is reading, especially Amish fiction. I enjoy reading works of both these talented authors. My mother enjoys reading Amish books. Thanks you for the opportunity to enter. I love to read, and l like to sew and do embroidery. I love quilts, they are so beautiful. I am lucky enough to have one of my grandma’s quilts. I love visiting the Amish area of Pennsylvania and zoning and Indiana. Purchased an Amish quilt years ago and cherish it even now. Would love to read this series. Thank you for this awesome giveaway. I love reading about the Amish . I don’t see how they make such beautiful quilts. Sure would like to win these books. I like to plant flowers and make special planters. I also enjoy cooking and baking pies and etc. I love ready Amish story books. I would love to win this set to add to my reading shelf. Thank you for this giveaway. My grandma and grandpa Ousley made and quilted all winter long with fabrics from old scraps of fabric and recycled alot of fabric from clothes that they didn’t wear or was just lying around. I have dabbled in quilting but just don’t ever finish one. I love sewing a crafting and using recycle items to make new items to out of them. Being on a very limited budget this would be a great addition to my limited book shelf right now so I can read and reread them. How fascinating that they both quilted. I don’t think I’ve heard of that before. I love reading the amish books! Love the recipes too! Love to read this! Sounds wonderful love quilting! My grandmother was an Amish school teacher in Lancaster Pennsylvania. She taught in a K-12 school house. Every summer we visited her and grandpa there and heard many wonderful stories. She loved making quilts. I would be overjoyed & thrilled to win this!!!! My favorite hobby is reading, followed by knitting. I really enjoy reading Amish fiction and learning about the Amish way of life. I love to crochet and make baby items for charity. I also sew dresses for charity also. Amish fiction is one of my favorite reads. I have quilted very small projects. I do crochet, sting beads for jewelry and sew. What an awesome contest! I would love to win! Love these books! I usually have to borrow from the library, but enjoy each and every one I can get my hands on! Glad to hear it, Julia! I love to read the Amish stories. It would be great if I win. I would love to win this. I am now reading Men of Lancaster County series.. On book 2, this would go along with them ,when I’m done with the series. Love reading this authors books.. I love stories about the Amish. I would love to win. I would love to have the Amish books. I love them. I have read a lot of them and always read any I find. I like to knit. I also like to read!!! I love Leslie Gold’s books and that quilt is beautiful!! I would love to do a quilt. But i like to read and crochet. My favorite hobbies are gardening and reading. I quilt in the picture looks amazing. Reading is my hobby; and I am very good at it, lol!! I love to Read about the Amish… I have Amish families that live on my road just east of me… Love seeing the children outside in the yard playing and working. Love Seeing Family Values in real life… Hard work Honesty and Family respect..
My “talents” are playing the organ and piano, and cross stitching. Every other Christmas, I cross stitch ornaments for family and friends. I love to read Amish books. I would love to win. What a wonderful giveaway…Thanks for the chance to enter and hopefully win . I’m a big reader and crafter. I love to quilt and read, especially stories about the Amish. I would love to win. I am a quilter from a quilting family that grew up in central Pennsylvania. The Amish and Mennonites were a large part of the communities I lived in…. It would be wonderful to win! I love to read Amish books and I have enjoyed these authors. I would love to win this book to read and cozy up with that Beautiful Quilt !! Thank You for writing and the opportunity to win !!!! I love to read Amish books and they remind me of when I was younger, going to Amish country with my Dad to go to the store to get butter and bread and meats in Middlefield. Thank you for this opportunity to win! I love reading about the Amish. I dabbled in quilting some small items, the largest being 2 wall hanging I made in 2 different quilting classes. My favorite craft I love doing now is making beaded bookmarks for the bags given to the vets at Fisher House. I’m friends with one of the authors who started authors4veterans that started this last Oct.. I fit that in between books I’m reading. I love quilts! I just made my first one. It’s only a patchwork and don’t look at the sewing too closely. I’ve been to Amish country in Hershey, Pa. Stayed there for a few days. They are amazing! I want to live like they do. Love quilting and Amish quilting! Great giveaway! I love these kinds of books. I also love to make quilted bookmarks. I have read so many Amish books, that I feel like I’m part of the Amish. I love reading Amish fiction and I’m reading one of their books now. Also, I crochet, embroider, and knit. What an exciting contest. Thank you so much! Blessings! I homeschool grand children. Love reading and scrapbooking. I love reading and Amish stories are my favorite!!! My favorite hobby is reading and then sewing. My favorite hobby is reading, especially Amish books. Thanks for the chance to win. My hobbies are reading and writing pen pal letters. Reading has always been my favorite hobby, even growing up. I like to read over watching TV. I love Amish fiction, and The Amish Quilter is the only book in this series I haven’t read. I also advocate for Disabled American Veterans. My Dad was a DAV from WWII, and I am a Life Member of DAV Auxiliary Unit 14 in Holland, MI. I enjoy going to the Grand Rapids Home For Veterans and just visit and listen to their stories. If I can get a small group together I treat them to donuts and coffee. Some of these men and women have no family or friends nearby, so hopefully I can make their day a little bit brighter. I enjoy sewing, crafting, reading and being outside in nature with my family. This would be a wonderful gift to receive!! Aw, no worries! We’re glad you’re excited about the giveaway! You can stop by and comment anytime. I love to read, garden, go camping with my husband and kids! Always bring an Amish book along! I love reading Amish stories, both true and fiction. Most of the stories are so graphic that I feel like I am at their supper table or riding in the buggy with them, maybe even in the barn watching the men muck out stalls or milk the cows. I also enjoy sewing and crocheting. Thank you for your wonderful stories, ladies. My favorite past time especially in the winter months is reading. I also love working in my flowers and gardening which I do as soon as it gets daylight. I do love my little greenhouse. So My life consists preferably of Church, Gardening, My flowers and of course Reading! I Do LOVE that Amish quilt! and would love to be a winner of it along with those Amish books! My hobbies are reading,cooking, sewing & crafting. I’m sure this is why I love to read Amish books. I love the recipes as well. Please keep writing. Never read a dull Amish book. I love Amish Books! The quilt is gorgeous! Thank you for the chance! I love to draw and I also enjoy coloring fuzz art pictures. It is so relaxing! I would love to win this. I have always wanted an Amish quilt and the books would be an added blessing. I always love to read Amish stories they’re interesting r always clean which is hard to find anymore. I would be happy to win and would share them with my family and friends. So excited to rea$ 5hese books! Love reading fictional Amish books and visiting Amish country. I have always wanted to purchase a quilt but haven’t been able to yet. Thank you for this exciting opportunity. My fa orite craft is crochet. Love reading about the Amish. I love making quilts and doing embroidery and cross stitch. I’d love to have an Amish quilt and read about them. We love going to the Amish country! I’ve always been fascinated with the Amish life. I have a library of Amish books by different authors. I love Amish novels! I have Amish friends so I picture them in the stories and pass the books to them once I finish them. I love scrapbooking and papercrafts, along with kniting. Now days reading and Facebook are the hobbies I give time to. Thanx for the giveaway!!!! I admire quilts and those who make them. I so love reading about the amish families. I love how the struggles are real, but they come together and make it work. They dont let the gadgets of today destroy the way of living. It seams like such a more peaceful lifestyle. What a wonderful giveaway! My favorite things to do are to cook and bake, read, take care of my family, and spend time with them outdoors! I have loved living around the Amish. They are hard workers. Sometimes we need to learn how to be simple. I myself love to garden. I love the harvest. I love to cook and bake. My most relaxing thing is playing the piano and hymns. I’ve read the earlier boks in this series, so must read The Amish Quilter. Thank you for the giveaway. I enjoy visiting Illinois Amish country that is close by. I refered six friends on FB but, don’t know how to record it to the the points for it. Hi, Beverly! Are you referring to the Refer-a-Friend option on the Rafflecopter form? (Here’s more info about that: https://kb.rafflecopter.com/hc/en-us/articles/204521949-Premium-Feature-Viral-Refer-a-Friend-Entry-Option) If so, you would have been provided a unique URL, and when one of your friends enters the giveaway using that URL you shared, Rafflecopter will record a point (up to 10 points). So, if that’s the option you’re talking about, points will depend on whether or not someone enters the giveaway through the link you shared. I hope that helps! Let me know if you still have questions or are referring to something else on the form. Thanks for entering the giveaway! I would love to read these books! I am trying to relearn how to crochet and knit. My grandma taught me when I was younger and since she has passed away I have been wanting to start crocheting again. I love books on the Amish!! I also quilt, knit, crochet, counted cross stitch and many more!! Sure would love to be a winner as I absolutely love, love to read your books. Wonderful give away here! I love reading Amish novels, & LOVE quilts! Lucky someone who wins this one! I really enjoy reading these books!! I love to read or crochet in my spare time. I think crocheting is relaxing. These books look very interesting. Living close to Amish and interacting with them, I have learned so much from these books. Thank you for this opportunity. Wow!!!! Would love to win! Thank you for a chance to win!!!!! I would be honored to win.i love books also and treasure them. I would love the honor of winning.thsnk you for your offer today.thank you for being able to wish for this!!!! I love reading about the simple life. Wish this world was more like the way the Amish live, hard work, Believing in God, our Heavenly Father, morals and helping friends and neighbors. Coming together in family, worship and love. I read 3-5 books week, write poetry, and collect kaleidoscopes. What a beautiful quilt!!!! I have lots of hobbies, sleep and Facebook seem to be the the ones that get my time these days! Thanx for the giveaway!!!!!! Oh I hope I get a chance to win the giveway of your books! I would love to win and add another book to my library! This would be such a awesome prize! would love these book’s for my daughter. Love all Amish books….just finished the Abram’s daughter series by Beverly Lewis and have several Amish cookbooks. Would love to be a winner! I used to dabble in a lot of different crafts but now I am into outdoor photography and of course reading. I love to read, play piano, and making sashay scarves. I would love to win. Thank you the opportunity/chance. Bless your heart dear one. I would love to read these books. Thanks for the chance. I would love to win this! Very nice give away! Can’t wait to read these, love Amish boks!!! Am fairly new to the Amish books and I love them! Thanks for the chance to win these books. I love reading Amish novels. Hoping I win! I am not very crafty, but I love and enjoy cross stitching. I love to read, see, bake and make all kinds of goodies from candy to cookies, cakes, pies, etc. love both of these authors, can’t get enough of their books. My favorite thing to do is read Amish fiction and about the Amish. I like to quilt and I like to read. Have not read any of the Amish books yet but will be looking for them now. Thank you for the opportunity to win some of these books! Looking forward to reading these books. thanks. I also quilt and crochet! My great great grandmother was Pennsylvania Dutch Margaret Daughenbaugh Tenbus, I read these book to understand her about her way of life. I also have friends who are Amish, I took my grand daughter Sylvia to meet my Amish friend Sylvia, my grand daughter admires the way they live but said she could never do it she loves her electronics.. lol. I also love quilting and crafting – it makes me very interested not only in the storyline, but also the quilting sub-storyline. Can’t wait to read the series!! I am a quilter and quilt historian — love anything to do with making, reading about or studying quilts. I love reading the Amish books. awesome prize, who wouldn’t love a quilt , thanks for this opportunity to perhaps be a winner. Love to read! So looking forward to new books coming out soon. Always need more reading material! Thank you! I would love reading about this quilting book! My talents lie elsewhere, however, because I love doing genealogy, reuniting biological families through genealogical research and DNA and that’s what I do best. I enjoy cross-stitching and reading though I don’t get to do it much during the school year. Looking forward to time this summer to catch up on my reading. I really enjoy reading Amish books and have read quite a few. Please enter me in the contest. I adore books. So my favorite hobby is reading. I bring a book with me wherever I go! I love to do craft like painting on canvas or modge podge and I also like to fish for Crappie and Bluegill. I love the Amish stories and have read most all of the ones at the Belington Library. I’ll have to go and look for the new ones!! I So Want To Read This Book! I Love These Types Of Books & These Are The Only Kind I Ever Read! I absolutely love quilts; especially, Amish ones. I really like to see the painstaking work that is so lovingly put into the work. They are exquisite! I want to read Amish Quilter. I enjoy all Amish books. I enjoy embroidery and hope to learn to quilt when retired. My mother is a quilter. I love your books and I hope I will get this book. I love quilting, too, and sewing and READING Thank you for this opportunity! I love to read the Amish books and go to Shipshewana etc. I quilt a lot of my time also. I would love to win these books and quilt for my mother in law she reads these all the time!!!! Would be an awesome gift for her. I love reading Amish books. I would be ever greatfull to win in this contest. My favorite hobby is crocheting and reading. I sure enjoy reading and when they are a series it’s wonderful . I used to sew and will take it up again once my job home schooling our boys is finished. I like working on my families genealogy trees and reading anything Amish. I love to crochet & knit. Quilting is something I have always wanted to try. I enjoy reading books about the Amish life. Their beliefs, morals, and overall independence amazes me. I read all the Amish books I can get my hands on. Their Faith in God has helped me during my current journey with breast cancer. They are encouraging, uplifting, and inspiring with their religious beliefs, as am I. Please keep coming with your great books!! I’ve attended many Amish Auctions(mud sales) hoping to purchase a quilt, however I have never been able to afford the high prices, unfortunately. I was hoping to buy a replacement quilt for the one my grandmother made by hand that she’d made for me, however was lost in a fireI still have the memory of it. That quilt so much, because I was the last grandchild to get one before she wasn’t able to do them anymore. I know there would never truly be a replacement, but a quilt would be just a tangible reminder. I really enjoy hand embroidery and making homemade cards. My two favorite things; Lancaster County, quilting! Been a couple of years since I’ve been to Lancaster County, but just driving through the country roads is my favorite thing to do there. It is absolutely beautiful!!! Awesome prizes! I love to read Amish fiction. I love to make jewelry! I am not a very crafty person. I did used to love to cross stitch (kits only, as they had everything included), and would like to take it up again. But my hanks cramp, and my eyes start seeing shadow images, so not sure I will be successful. I have friends who quilt, and one is fast but good at it, and I have thought about trying some quilting. We will see. Mostly my hobby is reading, and facebook. I would love to win the quilt and or the book. I love to do puzzles of any kind. All of the books look wonderful! Going to check them out on Amazon right now! Love reading Amish Fiction. Thanks for a chance to win. I love reading amish stores! I read books by all the arthors! My wish is to win! Love quilts and Amish stories! Working on a quilt now. Quilt and a book? A dream come true.